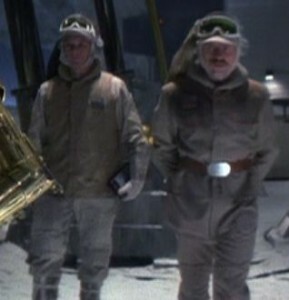 Hoth Hanger Technicians had an important role to play in the battle of Hoth. The technicians oversaw the shield generator the Rebel Alliance defence against any incoming Imperial attacks. They also helped maintain the Ion cannon used to take out a Star Destroyer and assisted in launching the Rebel Fleet off of the Hoth Planet when the Empire overran the Rebel defences. 2. The vest is several shades darker than the coveralls. The vest is quilted, front and back, from the bottom to the middle of the arm hole with large diamond quilts. It has a large padded ring shaped collar, and closes in front with no visible fasteners. It extends 2-3” below the natural belt line and is level from front to back with no dips or cuts. Two large un-quilted patch pockets with flaps are on the front. There is a window on the front left breast for a rank badge (only when the vest rank badge is worn). * See formal requirements below. 1. Rank Badge window on vest left breast, with Hoth rank badge.